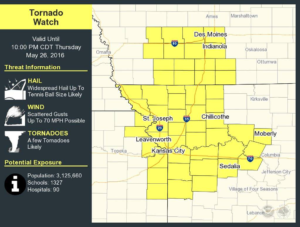 The National Weather Service office in Pleasant Hill says a tornado watch is in effect for much of northwest Missouri until 10 p.m. tonight. A tornado was confirmed in Platte County today. More tornadic activity and large hail are possibilities for much of northwest Missouri tonight. A tornado watch has also been issued for the central Missouri counties of Saline and Pettis until 10 p.m. Clusters of showers and thunderstorms will affect portions of central and south-central Missouri early tonight with large hail and damaging winds being the primary threats, along with frequent lightning. A flash flood warning is in effect until 8 p.m. tonight for the Missouri counties of Cape Girardeau, Scott, Carter, Stoddard, Wayne, Mississippi and Bollinger. Three inches of rain in one hour was reported today in the Cape Girardeau area. Motorists are encouraged to use caution while driving. Some have reported water sitting on or running over area roads. Water levels are expected slowly recede this evening as the rain lightens and exits in the Boot heel region. The Springfield area can expect a slight risk for severe weather, generally west of the Highway 65 corridor. The primary threat will be hail and gusty winds. Localized flooding could be a problem, especially for those that received heavier rainfall amounts earlier in the week. Widespread rain is predicted to continue through Saturday with a slight chance of rainfall on Sunday.